The behavior of U.S. employment at the end of the last two recessions (1991 and 2001) was different than in previous recessions. Employment did not grow fast and it took several years to reach the pre-recession levels. Because of this, the recovery years that followed both of these two recessions have been labelled "jobless recoveries". 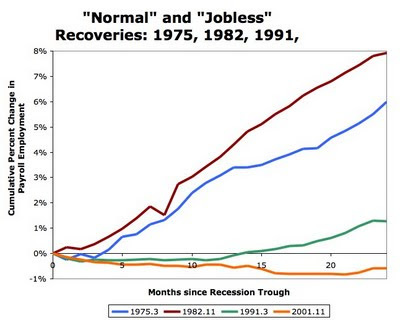 Below is a chart from Brad de Long that compares them to two other previous recessions (original posting is here). Employment was flat in 1991 and 2001 instead of increasing fast as in 1975 and 1982. Because of the current high level of unemployment combined with what might be weak growth there is a fear that the current recovery will also be a jobless one and that the unemployment rate will take a long time to reach a normal level (here is Krugman on this issue). The behavior of employment will depend on many factors (amount of labor hoarding, productivity) but at the end of the day, the major factor be remain the strength of the recovery and how fast GDP and demand can grow. If we look at different components of demand (or GDP) there is an interesting factor about the last two recessions: In both of them, investment played a weaker role during the recovery phase. 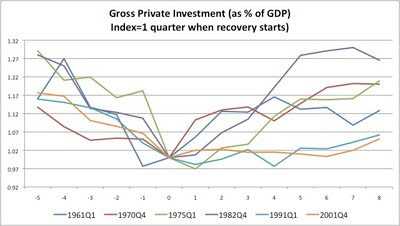 Below is a chart comparing the behavior of investment (measured as a % of GDP) around the recovery time (0 is the quarter when the recovery started according to the NBER). What is interesting in this chart is that the last two recoveries were also special when it comes to the behavior of investment. In fact, the behavior of investment seems to mimic what we see above in the employment chart. 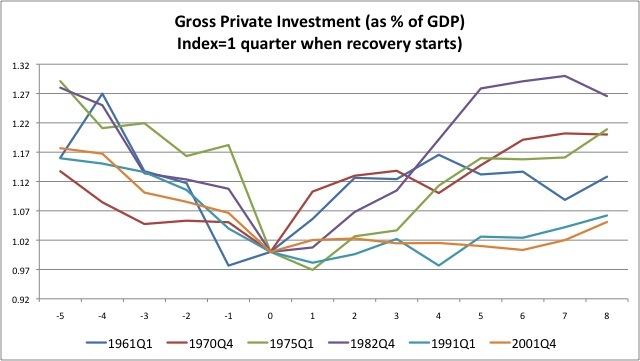 While during the 1975 and 1982 recoveries investment grew faster than GDP (so the ratio increased), during the 1991 and 2001 recessions, investment grew at the same pace as GDP (so the ratio is flat). And this is more of a surprise if we take into account the fact that real interest rates remained very low during these two recoveries (more so in 2001). We know that investment is the most volatile component of GDP so the V-shape that we see in 1975 and 1982 is what we would normally expect. By definition, it has to be that other components of GDP played a stronger role (relative to previous recessions) in 1991 and 2001 (consumption, exports). What was the exact role of those components will (hopefully) be the subject of a future post in this blog. What is interesting so far is the similarity in the behavior of employment and investment across the most recent recessions. There is an ongoing debate on whether we will see inflation or deflation during the coming years. Inflation could be a result of the expansionary monetary policies we have witnessed in many countries around the world. Deflation could be caused by the effects of the economic slowdown (asset price deflation, deleveraging, low growth) and its global nature. Despite these concerns, inflation indicators remain very stable. After a period where they were pointing in the direction of deflation, they are now back to levels which are fairly consistent with inflation in recent years. The stability of inflation forecasts and how they seem to be ignoring some of the theories that suggest more radical changes ahead are a reflection of the strong anchoring of inflation expectations that has been achieved in recent decades. This anchoring of expectations is the result of very low and stable inflation in most economies since the mid 90s. 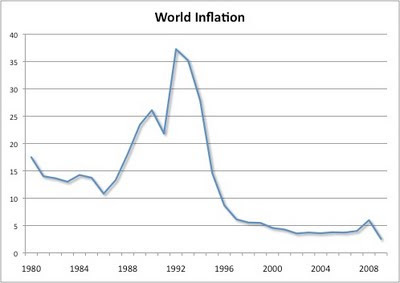 Here is the evolution of World inflation since 1980 (source: IMF World Economic Outlook database October 2009). 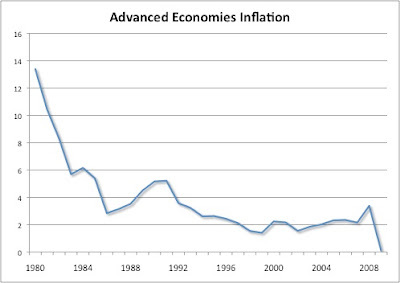 It is remarkable how after 1996 inflation has remained almost constant. While it is true that this was a stable period of time from an economic point of view, there were several episodes (the Asian crisis, the recession in 2001/2002) that could have had an effect in inflation. The fact that inflation did not react and remained in a very narrow range (between 4-5%) is behind the strong anchoring of inflation expectations. And this is a virtuous cycle: the more anchored inflation expectations are, the more stable inflation will be. 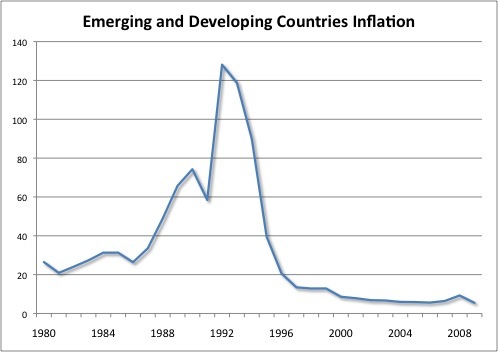 What is also interesting is to see that the behavior of inflation has been very similar across developed and developing countries. In the case of advanced economies, inflation decreased very fast in the early 80s and came down even more in the mid-90s. In the case of emerging markets we witnessed a period of high inflation during the early 90s but after 1995 inflation has come down and remained stable for 13 years. While 13 years of stable inflation cannot guarantee that we will not see large changes in the inflation rate in the coming years, there is no doubt that this is a reflection of the strong anchoring of inflation expectations, more so than in any other period in recent history and this stability is likely to keep inflation volatility low even in the presence of many uncertainties. It will continue to go up until it stops. Dennis Gartman, founder of The Gartman Letter told CNBC Monday that the price of precious metal will "continue go go up until it stops." "It is a gold bubble, Gartman told CNBC. He called the trade on gold "mind boggling," but also said that he is currently long - or betting gold will go higher. By the way, Willem Buiter has an interesting blog entry on the market for gold. Timothy Geithner said this week "I believe deeply that it is very important to the United States, to the economic health of the United States, that we maintain a strong dollar." It would be interesting to know what his definition of "strong" dollar is. When John Snow was asked the same question back in 2003 (May 18) when he was Secretary of the Treasury he said: "You want people to have confidence in your currency (...) You want it hard to counterfeit, like our new $20 bill." 9.5% productivity growth. How unusual? As reported by the Bureau of Labor and Statistics yesterday, US labor productivity grew at a 9.5% in the third quarter of 2009. Fast productivity growth is normally a sign of economic strength, but in this case because it is the result of a combination of GDP growth and destruction in employment, this has raised further concerns about the possibility of a jobless recovery (see Brad DeLong, among others). How unusual is to see productivity growing that fast during a recovery phase? No doubt that 9.5% is a very large number but we have seen similar patterns before. 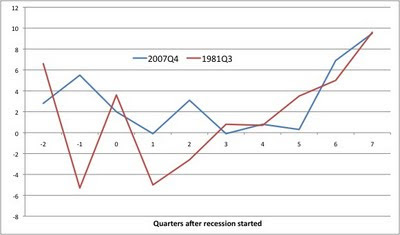 For example, the 1981Q3 recession showed a very similar pattern of productivity growth as seen in the picture below. Six or seven quarters after the recession had started, productivity was growing at rates which are very similar to what we are seeing now. Interestingly, the 1981 recession was also a long recession, it lasted 16 months. It is possible that the current recession ended in the summer of 2009 which would make it very similar in length to the 1981 recession. There is, however, a big difference between the two: in the 1981Q3 recession, we saw GDP growth rates close to 10% (quarter to quarter) seven quarters after the recession started - i.e. the last observation in the above chart. This time GDP is only growing at 3.5% and it is only because of the large decrease in employment that productivity growth is so high. This is not good news (unless we believe that this trend is about to reverse). What did productivity growth look like in shorter recessions? This second chart shows productivity growth in the previous two recessions (1990 and 2001). Both of these recessions were short, about 8 months. 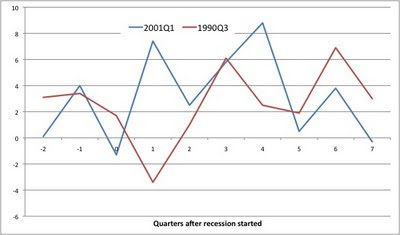 Productivity also increased in the quarters after the recession started. It started growing earlier (this is probably related to the short nature of the recession) and it did so in a smoother manner with peaks below the current levels. The IMF has just published their November 2009 edition of "The State of Public Finances Cross-Country Fiscal Policy Monitor". It is a great analysis of the current state of public finances and the risks ahead. Some good news: if one looks carefully at the numbers, while deficits and debt levels are high, they are manageable. They require an effort in the years (decades?) ahead but we have seen large fiscal consolidations in the past of a size which is similar to what is required from today's perspective. This seems to be the perspective of financial markets as interest rates on government bonds remain low and there is no obvious pricing of a default risk. The arithmetics of fiscal discipline are simple and the future effort will depend on the difference between the interest rate that governments will face and the growth rate of their economy. In emerging markets, we have seen rapid changes in this difference (interest rate getting very high as growth rates slow down) leading to crisis as the burden becomes unmanageable. While this is not the scenario that one might expect for advanced economies, it all depends on the credibility that governments established. And theoretically one could imagine a self-fulfilling prophecy where a crisis starts with a small change in the perceived credibility of governments which increases interest rates and leads to unsustainable interest payments. The bad news is that there is no guarantee that governments will behave better going forward. Yes, we know the effort that is needed to stabilize debt-to-GDP ratios but history is full of examples where once the crisis is over we forget about fiscal policy discipline. And here is where we need an exit strategy. It is not about about announcing a short-term schedule to remove the current fiscal stimulus is about giving reassurances that in the next decade or decades we will look at sustainability of government finances in a different way. I have argued in some of my academic research (together with my co-blogger Ilian Mihov) that there is a need to think about institutional reforms that change the way we think about fiscal policy and budgets. Other academics have presented similar proposals, all of them implying the creation of some constraints around the power of governments to decide on all aspects of fiscal policy. While numerical rules are the simplest way to think about constraints (budget balance rules, stability and growth pact), the empirical evidence is that implicit constraints - such as those created by the political process through which budgets are decided- can be as powerful and less rigid. A change in this direction would be a good "exit strategy" for governments. Without the need to harm the current recovery, it would provide the necessary foundations for a credible fiscal policy in the years ahead.